One really great subtropical fruit related to apples, pears, and peaches that grows well in our area is the Loquat. Also called Japanese Plum, this easy-to-grow evergreen tree with large dentate leaves is a popular ornamental for its tropical appearance. Loquats make great trees where overhead space is limited or as a specimen tree or a patio shade tree. While able to tolerate partial shade, this tree will do best in full sun and accommodates nicely to Florida's higher pH soils. White fragrant flowers appear from October to February in Florida and bears clusters of small golden fruit of 1-2" in diameter in early spring. The fruit has a large seed and has a mild, flavorful flesh. Loquat fruits are excellent eaten fresh or made into jelly, jam, preserves and pies. Fruit must be tree-ripened for the best flavor. A mature tree may bear from 35-300 pounds of fruit per tree per year. While loquats are considered somewhat short-lived trees living only 20-30 years, I would recommend them for every landscape. Loquats look tropical, are hardy and somewhat drought tolerant, and provide a tasty crop of fruit on a yearly basis. Late February and March starts the season for this fruit when few other fruits are readily available. Fruit must be tree-ripened for the best flavor usually by March. Loquats are hardy along the coasts as far north as North Carolina, but the flowers can be damaged by frosts. Our loquats are seedlings and can take up to 6 years to bear fruit. Be careful not to over-fertilize these trees as this can make them more open to attack by fire blight, a disease of plants related to pears. Loquats are a somewhat short-lived trees living only 20-30 years, I would recommend them for every landscape. Loquat trees are very cold tolerant and may withstand temperatures down to 8° to 10°F. However, the flowers and fruit are killed by temperatures below 27°F. 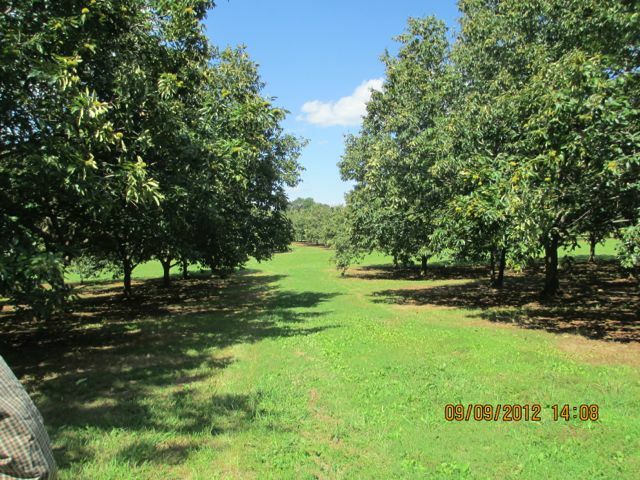 Temperatures above 95°F may negatively affect loquat tree growth. In general, loquat trees should be planted in full sun for best growth and fruit production. Select a part of the landscape away from other trees, buildings and structures, and power lines. Remember loquat trees may become moderately large if not pruned to contain their size. In areas where there is a chance of spring frost, select the warmest area of the landscape. In locations where this is not a concern loquat may be planted anywhere in the landscape. Loquat trees should be planted in areas that do not flood (or remain wet) after typical summer rainfall events. Your planting site selection should be well-drained, non-low lying area, sandy loam soils with a pH between 5.5-7.0. Prepare the area by removing any weeds prior to planting. This step is often overlooked but is absolutely critical to any successful planting. Weeds and grass steal light, water and nutrients from your trees. Remove the pot stake that came with the tree. If the tree appears stable staking is not needed. If staking is necessary, hold the trunk with one hand to find the height at which the unsupported top can stand up on its own and will spring back to a vertical position if lightly flexed. Allow trees a slight amount of flex rather than holding them rigidly in place. Tree straps should be made of material that will not injure the tree or girdle the tree. Plant the tree at the same height they were grow in the pot, not deeper. We recommend creating a water-holding basin around the hole and water the trees in thoroughly at planting. Remove the berm at the end of the second growing season. Water slowly at the drip-line. Water in thoroughly, making sure there are no air pockets around the roots. Air pockets prevent roots from growing into the soil around it. After the water has soaked in, spread a protective layer of mulch 2-4" deep around the trunk pulling the mulch a few inches away from the trunk. Choices for mulch, leaf litter, hay, shredded or fine bark, pine needles. The type of fertilizer you choose may be chemical or organic. Make sure that the fertilizer contains iron, zinc, manganese, magnesium, molybdenum, copper and boron. These minor elements are very important to plants and most soils are low in these elements. You can fertilize with 10-0-10 with minerals, or Espoma Citrus Tone (Organic). Application rates vary according to age of plant. Spread the fertilizer evenly under the entire canopy of the plant avoiding a 5-inch area around the trunk. Water or rake in. For Zones 8a-10, fertilize 3 times each year in late February, late May and late July/early August. Never fertilize after August as this will promote new growth late in the year which will be subject to freeze damage. The first year is a critical time for the establishment of a new loquat. Water at planting and every other day for the first week or so then 1 to 2 times a week for the first few years. Water regularly, especially during dry periods. Fruit may drop prematurely if insufficiently watered during dry spell. Once the rainy season arrives, reduce or stop watering. Over watering may cause trees to decline. Once loquat trees are 4 or more years old, water them during the fruit development period and during prolonged dry periods. Remove dead wood at any time. To control tree size prune during the first 1 to 2 years after planting, prune young trees by tipping shoots in excess of 2 to 3ft, tipping will increase branching. Trees may be trained to a modified central leader or open center configuration. Mature trees may be selectively pruned to maintain trees at 6 to 12 ft in height. This will make care of the tree and harvest easier. To improve fruit size, you may wish to hand-thin flowers or fruit. Allow anywhere from 4 to 10 fruits to develop per terminal. Thinning will increase fruit size from 25% - 100%. In areas with insects and or bird fruit pests, bag the fruit clusters. Bagging also hastens fruit development and reduces fruit scaring. Pruning: Remove dead wood at any time.